Were he still with us, Dr. Ian Richard Kyle Paisley would be celebrating his ninetieth birthday. Born into the serene and scenic surroundings of County Armagh (Northern Ireland) on 6th April 1926, young Paisley’s voice was to thunder through his native Ulster both as a political activist and a Free Presbyterian minister. Beyond the frontiers of Northern Ireland, Paisley’s fame resides predominantly in politics. Nevertheless, Paisley’s influence upon many Ulster men was first and foremost of a spiritual nature. Indeed, it was his powerful Word-based preaching that inspired –and continues to inspire- a whole generation of Evangelical ministers. Although I (sadly) never got to meet Dr. Paisley in person, I do recall seeing him in front of the Belfast City Hall evangelizing with fellow-members of his Martyrs Memorial Church. Moreover, he was on the news almost every day as I was growing up. As I began to take church attendance seriously after my conversion to Christ back in December 2002, I also remember various preachers frequently alluding to sayings or anecdotes of Paisley’s in the pulpit. Today, my attempt at honouring the legacy of Reverend Paisley will be limited to one sermon of his that shook me to the core. I am referring to his classic message –‘Fundamentalism Versus Apostasy’- delivered in the United States of America in 1969. To this day, no other message has so singularly blessed me as an itinerant Gospel-preacher in Spain. I have lost count of the amount of times I have listened to it as a means of edification and comfort over the years. What I want to do is outline ten key factors from the sermon that revolutionized my thinking about Christian preaching and that could potentially do the same for all of us today in the twenty-first century. The first thing that almost invariably strikes any one listening to Paisley’s message is his unique note of authority. Just as the multitudes were astonished by Jesus’ preaching back in the first century (John 7:46) so it was with Paisley. He didn’t teach the people as a detached theological professor but as a real life preacher who meant business with God and His Church. Paisley’s message left no one indifferent. You were either for him or against him. That simple! Such authority can only be understood as a precious gift of God. His lips had been touched by the live coal from the Lord’s altar (Isaiah 6:6-7). There was nothing metaphysical or philosophical about Paisley’s ‘Fundamentalism Verses Apostasy’ message. As Paisley put it, “You won’t need a dictionary when I’m through”. It was good old-fashioned plain speaking, calling things by their name. Throughout the sermons he lays a blow to the National Council of Churches, the World Council of Churches, the Pope, the plague of Higher Criticism and liberal preachers/ theologians such as the Methodist Leslie D. Weatherhead who taught that Jesus was the offspring of Zachariah (John the Baptist’s father) and Mary (a Temple prostitute). When Weatherhead visited Belfast, Paisley publically conferred upon him an honorary G.O.V. degree later explaining to the press that G.O.V. stood for ‘Generation of Vipers!’ (Matthew 23:33). Paisley sure didn’t believe in mincing his words. Paisley’s sermon is rooted in the conviction that God can and will do something about apostasy. By no means did Paisley think that believers had to passively resign themselves to the onslaught of approaching corruption. They were to resist the work of the devil by sharing the triumph of the cross of Christ. God, promised Paisley, has victory for His people even in the darkest of days. So rather than lamenting the turn towards theological liberalism in the West, Paisley saw it as an opportunity to wage warfare in the name of the Lord of hosts. According to Paisley, the Evangelical preacher had one unconquerable weapon in his hand to overcome all the strength of the apostates, that is, the blessed Book of God. Luther had nothing but the Bible and he gave the Pope “spiritual rickets”. Paisley was adamant that a God-glorifying church could only be built upon the Rock of Scripture. “Stick to the Book!” he cried. He also encouraged the preachers in the congregation to be sure to warn their people about false preachers in nearby towns. The standard in all pulpit-ministry was to be the blessed Word of God. “If you leave this Book,” said Paisley, “something’s wrong”. 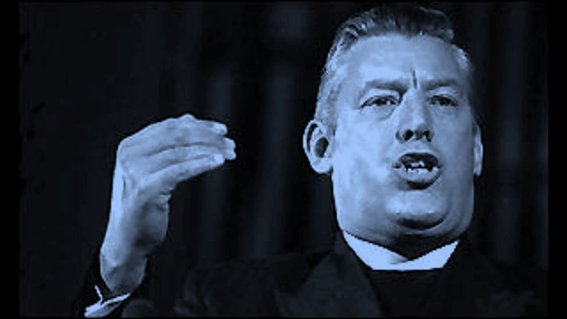 Compromising preachers were what most concerned Paisley in his sermon. He told his listeners that he himself had prayed to the Lord: “If I ever compromise, put me into a coffin”. He decried heralds of the Gospel who had “polluted” their message with worldly gimmicks and unsanctified evangelistic methods. “Away with it!” He names two such concrete examples: preachers who let their congregations put shaving foam over them if they got 150 people out to a church service; or others who would swallow a goldfish if they got 500. All this carnal bait ultimately led to ecumenicalism in which Evangelical preachers no longer “take a stand” for the truth of Scripture. Holiness, on the other hand, always stands up for God’s Word. Better have a near to empty church than a huge compromised church. Quoting the American preacher W.B. Hinsen, Paisley said, “There is something worse than an empty church, that is, an offended God”. God’s preachers could strengthen themselves via the means of prayer and intercession. Using the confrontation between the archangel Michael and the devil in the book of Jude as an example, Paisley showed how Michael called in the Lord to win the battle. “Bring the Lord in!” God’s people may not have strength against the devil but their Lord is infinitely more powerful than satanic strength. It is in the place of prayer where one can overcome the wad of insults that are unjustly launched against the Lord’s spokesmen. It was also by prayer that preachers could ask the Lord for “Holy Ghost speech” in the pulpit. Such soul-hot prayer would make preachers bold in the Lord and not be afraid of preaching the truth in public. “No one has time for a man who clears his throat and blows his nose and says: I’m awful sorry I have to say these things”. The preacher has got to get to it and preach the Word. But he cannot be bold if he hasn’t ascended the mountain-top of prayer. Paisley was evidently inspired by the example of the revivalist W.P. Nicholson. Through the ardent prayers of Nicholson, Paisley explained how revival touched parts of Scotland as he cried out, “Lord, stir this little sleepy half-damned village”. The same blessing hit Ulster under Nicholson’s ministry as between 1,200 and 1,400 souls were added to the Lord’s Kingdom after only three weeks of evangelistic meetings there. Another omnipresent element in Paisley’s sermon from beginning to end is his passion for the Lord Jesus Christ. The sermon is peppered with spontaneous words of praise that usher froth from Paisley’s lips. As far as he is concerned, Jesus is the sinless, perfect, incarnate Christ. He is the wonderful Saviour, the true Victor and Champion of the cross. Christ is the sole foundation of faith. That is the glory of the fundamentalists. At one point in the message he explains that he longed “to see the face of the King”. Jesus was his chief motivation in all of his scraps and battles. He didn’t want the Lord’s name to be offended or defiled. He was willing to be hurt so that he could protect his precious Saviour’s name and glory. Paisley’s command of Scripture is impressive. He quotes widely from many different parts of the Sacred Book. However, he also uses church history to great effect alluding to great men of God used down and throughout the ages. He makes mention of Martin Luther and the great Northern Irish revivalist W.P. Nicholson. Leonard Ravenhill, it should be pointed out, labelled Nicholson “the Irish Whitefield”. He also alluded to the Puritan giant John Bunyan –famous for his ‘Pilgrim’s Progress’- and New England’s very own Jonathan Edwards. Furthermore he also recalls the legacy of the sixteenth-century Scottish reformer/martyr Patrick Hamilton who was burnt at the stake in St. Andrews for the Protestant Gospel he preached. Paisley, then, was conscious that the lives of God’s saints were marked by constant turmoil and tribulation. So he found strength in the Word, in prayer and also in church history.